When Gillian Anderson announced she was done with the series — ahead of the season 11 premiere — we knew this day was coming. The X-Files TV show on FOX is cancelled, at least for now, Deadline reports. To be fair to the network, they were clear the revival was for limited 10th and 11th seasons. However, all is not lost. While Chris Carter has said that, while he never imagined the series without Anderson as FBI Special Agent Dana Scully, he is open to future seasons, with or without her. A FOX sci-fi mystery thriller, The X-Files also stars David Duchovny as FBI Special Agent Fox Mulder. Together, Mulder and Scully investigate unexplained or “X-Files” cases — which have answers involving paranormal phenomena. Mitch Pileggi, William B. Davis, Annabeth Gish, Lauren Ambrose, Robbie Amell, Veronica Cartwright, Chris Owens, and Dean Haglund returned for season 11. They were joined by newcomers including Barbara Hershey and Haley Joel Osment. The 11th season of The X-Files averaged a .96 rating in the 18-49 demographic and 3.742 million viewers. Compared to season 10, that’s down by 69% and 60%, respectively. Find out how The X-Files stacks up against the other FOX TV shows. What do you think? Are you still a fan of The X-Files TV series? Do you think it will come back for season 12, some day? Let us know, below. Well, they can’t just leave us hanging with that season 11 ending. C’mon now, give us a decent wrap up. It’s the least ya can do… PLEASE! I was so happy to have X Files back on since I was a big fan. I hope it remains on even if it changes network. I have been an avid fan from season 1 to season 11. I hope there will be a season 12. Mulder and Scully get better with age. Just keep on keeping on. Watching re-runs as I type this. Doggett and Reyes should come back if Scully doesn’t come back and it will be OK if Scully comes back. All 4 made a great investigative team. im one of the biggerst fans of the X-Files, but i think it should never been renewed, it didnt give much tension like the old ones, except the last episode, Gillian Anderson is right not coming back. They should renew X Files from more seasons, even bad season is 10x better than useless POC from CW, like Arrow, Flash and other kids TV shows from that network. As much as i love this show. this one can be stayed cancelled for me. So that they don’t upset the fan base. 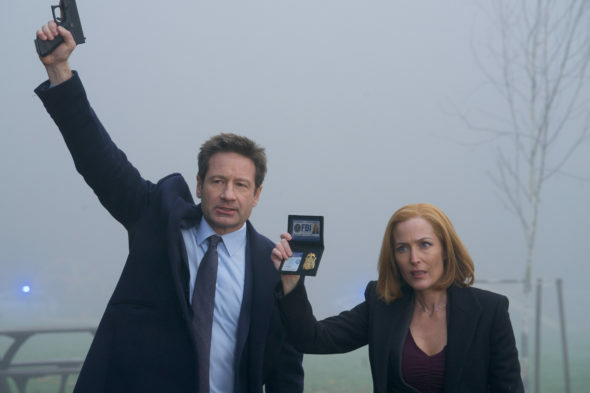 fox didn’t say that the show was cancelled there just hasn’t been any converstions about season 12 hopefully there will be in 2019 even if Gillian is not in the show it could be a really good storyline to search for scully like mulder was in season 8 and she could appear in an episode or 2. William along side mulder and maybe Doggett or Reyes in the new season to. These are great ideas! Those and more, just more! We already knew that it was the end. Perhaps wait a year or so and see if Anderson changes her mind.